Mary Dombrowski (Plays, Poetry, Documentaries) is the creative mind behind 'Living Water Theater', a company that has performed to acclaim for faith communities across western Washington. She is also the author of Living Water, Road to Jericho, Squander Your Inheritance - three short plays written during 1989 and 1990. Dombrowski's poems have appeared in various publications such as Poetry Corners, Exhibition, and Scotch Broom and she has performed her poems at Bainbridge Performing Arts events, Bumbershoot, and the Poulsbohemian Armchair Poets Series. In addition, Dombrowski has produced several documentaries on the military necessity of Japanese-American internment during WW II. Her movie When Tokyo Struck at Kingston: Apple Tree Pt., 1942 was shown at the Lynwood Theatre during the 2006 Celluloid Bainbridge Film Festival. 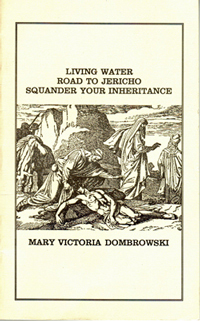 For more information on this author go to http://www.livingwatertheater.com/.